Sally Ride made history and captured the nation’s imagination when, blasting off aboard Space Shuttle Challenger in 1983, she became the first American woman–and at age 32, the youngest American–to go into space. Now, the U.S. Postal Service will honor the legacy of this pioneering astronaut, brilliant physicist and dedicated educator with the Sally Ride Forever Stamp. The first-day-of-issue dedication ceremony will be held Wednesday, May 23 at 5 p.m. in the Price Center East Ballroom on the UC San Diego campus, where Ride was a member of the physics faculty. The event is free and open to the public. To attend, RSVP online at usps.com/sallyride. In 1977, Ride was finishing her Ph.D. in physics at Stanford when she saw an article in the student newspaper saying that NASA was looking for astronauts—and for the first time was allowing women to apply. Ride was among the first six women chosen to join the astronaut corps. When the space shuttle Challenger blasted off from Kennedy Space Center, Florida, on June 18, 1983, she soared into history. She flew a second time aboard Challenger in 1984 and later became the only person to serve on the presidential commissions investigating both of the nation’s space shuttle tragedies. After retiring from NASA, Ride joined the UC San Diego faculty in 1989 and served as a professor of physics until her death in 2012. In addition to leading pure and applied space-science research at UC San Diego, Ride co-authored seven books about science for children, and was co-founder, president and CEO of the educational company Sally Ride Science. Now based at UC San Diego, Sally Ride Science has a mission to motivate young people to become literate in science, technology and math and to consider pursuing careers in these fields. Ride received many honors, including the Presidential Medal of Freedom–the nation’s highest civilian honor–awarded posthumously by President Barack Obama in 2013. In 2016, the U.S. Navy commissioned a research vessel named for Ride. Scripps Institution of Oceanography at UC San Diego operates the R/V Sally Ride. In December 2017, the U.S. Postal Service announced that Ride would receive yet another honor. She would be commemorated on a Forever stamp in 2018 along with other icons including rock ‘n’ roll hero John Lennon; legendary singer and actress Lena Horne; and beloved children’s television host Fred Rogers. 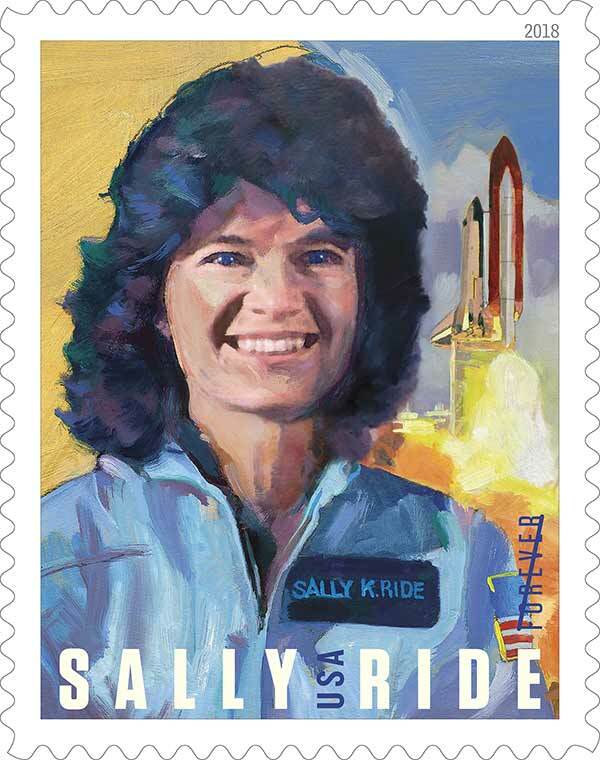 The stamp art features a colorful portrait of Ride in her flight suit with a dramatic depiction of a space shuttle lifting off in the background. Sketched first in charcoal and then rendered in oil paint, the image was designed to reflect her positivity and confident spirit as well as the excitement and danger of space travel. Following the dedication event, Sally Ride Science at UC San Diego will host a private, invitation-only event at the Price Center to celebrate the release of the U.S. postage stamp. King and Ochoa will join Condoleezza Rice, 66th U.S. Secretary of State and a close friend of Ride’s, for a conversation on Women in Leadership. With journalist and author Lynn Sherr serving as moderator, they will share their personal stories and their vision for how women can help lead our nation to a better future. Joining the panel will be UC San Diego leadership including Chancellor Khosla and Executive Vice Chancellor Elizabeth H. Simmons, both of whom will offer opening remarks. O’Shaughnessy will introduce the panelists, who bring fascinating perspectives on what it means to be a woman in a leadership position in sports, science, diplomacy and other realms. King, who achieved tennis immortality by winning 39 Grand Slam titles, has long been a crusader for equality for women in sports and for social justice in all areas of life. She was named one of the “100 Most Important Americans of the 20th Century” by Life magazine and was awarded the Presidential Medal of Freedom. Ochoa, a research engineer, became the first Hispanic woman in space aboard space shuttle Discovery in 1993. She flew in space four times, logging nearly 1,000 hours, before becoming director of NASA’s Johnson Space Center in 2013 where she leads the human space flight enterprise for the nation. Rice, a professor of political science at Stanford University, served as U.S. Secretary of State under President George W. Bush from 2005 to 2009. She was the first African American woman to hold the post. Rice also served as Bush’s National Security Advisor from 2001 to 2005, becoming the first woman to hold that position. Sherr, the panel’s moderator, is an award-winning broadcaster and author who spent more than 30 years with ABC News. While covering the space program, she became friends with Ride. 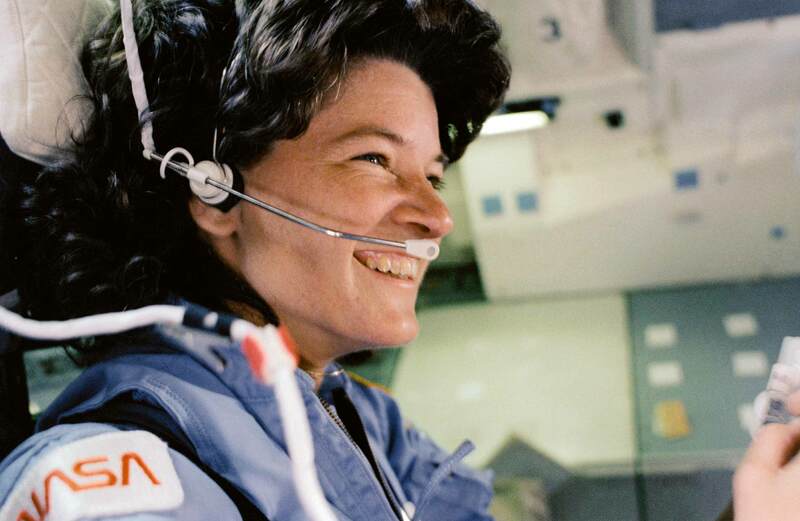 After Ride’s death, Sherr published a biography, Sally Ride: America’s First Woman in Space.